There’s no right or wrong way of doing a Social Friday, just like there are no right or wrong volunteer activities. Yet, from our experience, we know that choosing a volunteer activity, especially that initial one, can put a lot of pressure on the company. So in order to inspire you and help you make this decision faster, we put together a list of 8 volunteering ideas with hopes that one of them might just be the right fit for you and your team. Being a patient can be a scary, overwhelming, not-so-fun time – away from home, school, friends and ordinary life. Hospital volunteer programs help kids be kids… when they need it most. Putting a smile on a kid’s face is an incredible feeling. Senior citizens have a lot of free time and never enough fun and laughter. You can organize a classic bingo night or any other type of activity like a book reading, for example. 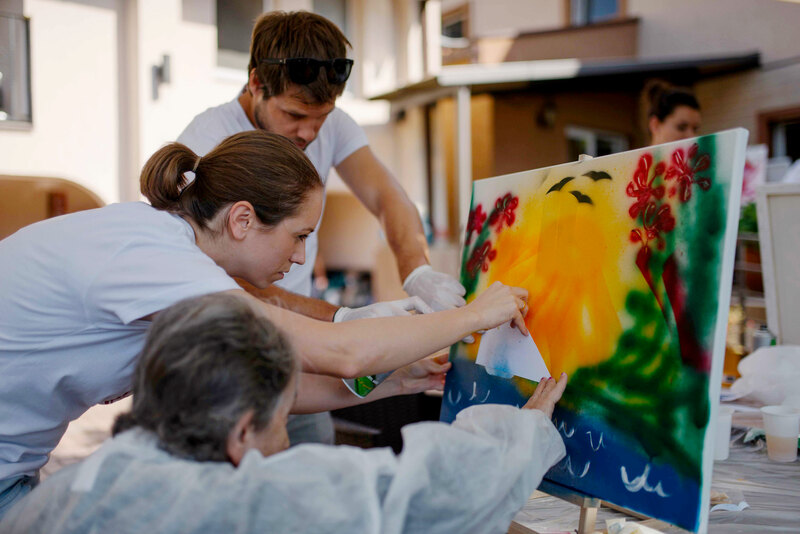 We recently hosted a spray painting workshop for seniors at a local retirement home. Together with the help of some local artists/graffiti-experts, we learned how to spray paint on canvases and made some artwork which we showcased and sold at a local gallery. The proceeds from the sales were donated back to the retirement home. Cooking or providing food for those in need is one of the most rewarding volunteer experiences. Employees can immediately see the impact they’re making and be inspired to get engaged in similar ways more often. Organizing and collecting donations with your team is a whole days activity. You can donate clothes, blankets, food, and medicine to a homeless shelter or to those that have recently been affected by some catastrophic event. No city in the world has enough special olympics events. With a little effort you can organize one – it can even be adapted and focused on children and teenagers. Another area that never gets enough of our care is our environment. Our parks can always be cleaner and there is simply no such thing as “enough trees”. If you’ve got an office full of animal loves, then this might just be the perfect volunteer for you. Dogs and cats are social animals and shelters simply don’t have enough people to give them the attention they deserve. Make their lives better by dedicating a day only to them. They deserve it. Charity races are not only a great way to raise funds, but they also raise awareness, get lots of attention, and engage your coworkers and the community in a healthy activity. You can choose to dedicate the race to whichever cause you find most suitable. Although this would make for quite an amazing Social Friday, because this activity will require a little bit more planning and effort, we recommend that you save it for sometime down the road once you are a little bit more experienced.